One of the first things to know about me is that I’m always on time. Lots of times, I’m early. But my closet, on the other hand, is always running rather late. Case in point: those wide-leg, high-rise pants that were everywhere in my part of Brooklyn in late 2017 into 2018. They just came home to roost in my closet a few weeks ago. The jolie laide shearling clog that seems to have taken over feet at morning school drop-off? I waited until my clunking around in them is more cliché than chic. Point being: When it comes to fashion, I am a hopeless late adopter. Ten or 15 years ago, the knee-high boot-over-jeans look was everywhere: riding boots, boots with spiky heels, boots with chunk heels. I immediately saw the look and scoffed. “If I wanted to look like Puss in Boots, I’d poke a feather in my cap and talk like a pirate.” Fast-forward a year or so, and there I am, clomping around in one of two pairs of knee-high boots I owned. And it’s been that way with most trends, to be honest. Skinny jeans, boyfriend jeans, mom-jean jeans. Ruffled neck blouses, cold-shoulder blouses; midi skirts, pleated midi skirts, midi skirts with booties. Frickin’ Uggs. 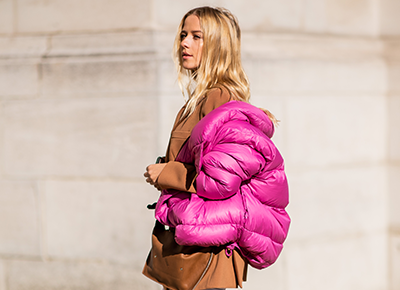 That sort of hideous puffy, oversized coat that Amazon can hardly keep in stock. All of them were a hard pass for months, years…until I clearly got worn down by their ubiquity after seeing them on women I admire, women who just ooze natural style, or on women who have my body type and made me feel like whatever item in question wasn’t such a crazy idea after all. On other occasions, it’s not so much that I needed a change of heart, but it’s more that I didn’t even notice a trend. To mix a metaphor: It takes a lot of trees for me to see the forest. And then I wanna DANCE in that forest. Of course, it all begs the question: Why can’t I take such small risks on my own? Why be such a total lemming? After all, I’m definitely cruising through that part of life where the f*cks I have to give are in short supply. I’m confident in my skin, and certainly don’t blush easily. And yet, when it comes to what I put on my body, I’m coming to realize that, while for some people clothes are self-expression, or an art form, they function a bit differently for me. My goal, when dressing myself, is to blend right in—to NOT make any sort of statement—and by waiting until something becomes background noise, I’m ensuring I play it safe. But what if I went out on a limb? What if I noticed a new silhouette or shoe and gave it a go? Since apparently the “unexamined life is not worth living” (props to Socrates), I’ve given that aspect some thought. I guess it’s partly because in a world where so many things feel out of my control or require my full emotional attention (exhibits A and B are my two daughters), and during times where my physical comfort isn’t always guaranteed (looking at you chronic migraines and persistent back pain), my need for effortlessness has become rather strong. And one other thing: By going with what’s at its peak or is pretty much on every store shelf, I’m able to find the iteration that fits me just right, looks good on my body and suits my budget. If that means an amazing knock-off version of the $800 original dress that now comes in petite sizes, sign me up. So yup, that’s me in the massive, beige teddy-bear coat I just brought home over the weekend. I used to hate it, but (surprise, surprise) now I won’t leave home without it.